It’s not a secret that battery power has become a key ingredient in the equipment portfolio of the average warehouse. However, for most facilities, batteries are often an overlooked item that is seen as just an “accessory” whose importance is overlooked in the day-to-day operations. But with the growing variety of applications and the complexity of different kinds of battery chemistry becoming prevalent in the mix. Today we’ll look at the best practices involved in charging and maintaining the various types of batteries you currently use – or will use - every day in your facility. What Kind of Batteries Do You Have? Let’s start with a quick overview of the types of batteries you might have in your warehouse. Lead Acid - Most facilities will be familiar with the everyday forklift battery. Depending on the model being used, these will be lead-acid batteries (the same chemistry as a typical car battery). Lead-acid batteries, while functioning as the workhorse source of mobile power for years, have always had a disadvantage of being extremely heavy, ranging from as small as 300 pounds (136 kilos) to a massive 4600 pounds (2,090 kilos)! 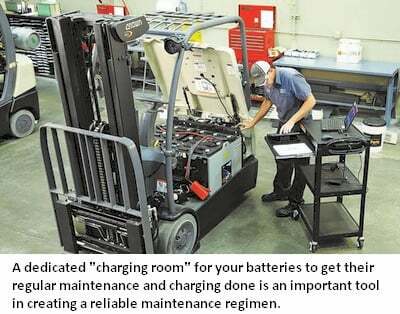 Note that forklift batteries tend NOT to be “sealed” lead acid, meaning there is more you can do for them in terms of maintenance and refurbishment. Lithium Cobalt Oxide – While they have a high capacity suitable for cellphones, laptops and cameras, Limited power, shorter lifespans and frequent charging required. Lithium Manganese Oxide – Safer than Cobalt, this chemistry is more commonly used in medical equipment and devices as well as power tools and electric bikes. Lithium Iron Phosphate – With very low resistance properties, lower cost and longest lifespan, they can be stored with little loss of total lifespan. Its application is limited due to lower energy output, but is widely used in electric vehicles. Lithium Nickel Manganese Cobalt Oxide – somewhat less expensive than other options due to the higher nickel content and most common in-vehicle power trains and power tools for its low self-heating rate. Lithium Nickel Cobalt Aluminum Oxide – referred to as “NCA” batteries, these are high-energy and high cost, and are most common in grid storage or electric vehicle powertrain. Lithium Titanate – despite a lower density, the nanotechnology used to create these give them the fastest recharge time. Wind and solar energy storage and smart grid applications are potential applications. You will likely have some or all of the first three in use in your warehouse, and less likely to see the last three – for now. As for the “Why?” of battery maintenance? To start with, the standard life of lead acid batteries can be cut in half if not maintained properly. If you’re going to spend from $2,000 - $10,000 for a single battery for your forklift and it is only expected to give you 300 cycles in the first place, why cut that in half and force yourself to replace it every 6-8 months? Worse, you could void your warranty in the process of neglecting your batteries. 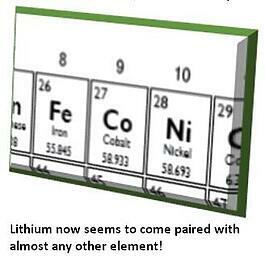 Charging – Lead acid recharges at a rate of about 15-20% per hour. If you have a big operation, make it someone’s responsibility to make sure charging is getting done at the end of every shift. If you don’t have a dedicated space for charging or even a “charging room”, then you might want to consider setting one up. A dedicated charging room can make a big difference by elevating the task of charging to a more “mission critical” nature, rather than an afterthought or “not my problem”. With lift drivers having to answer to a colleague who is responsible for this vital function, it becomes harder to dismiss and can be incorporated as part of their daily routines. 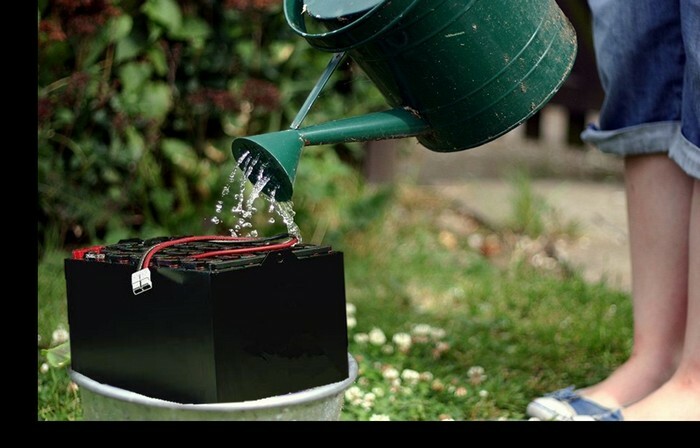 Watering - While a charging room would make sense for every type of battery chemistry, it is especially critical to the lead acid battery because of the other types of maintenance involved often extend the life of these batteries. Watering your batteries is another critical component of maintenance that is often overlooked or not structured in a fixed process. Aside from ensuring the best performance for your batteries, it also is a safety measure that prevents exposure to from sulfuric acid spills. An automatic watering system is an investment that makes sense in a charging room, as it will reduce the labor required to maintain your batteries and also make this task more precise and accurate every time. Inspection – Implementing a regular inspection regimen is another critical yet overlooked area of battery maintenance. Keeping a catalog of all of your batteries - and their condition – is the starting point for this. Then monitoring the changes in their condition as part of a regular inspection that determines next steps in maintenance, refurbishment or replacement. Items to track could include things like Voltage reading, charge time, corrosion levels, etc. with the data utilized to determine when replacements are warranted. It should also be used to monitor things connected to the battery – terminals, wiring, the housing, etc. as well as water levels. The data gleaned from implementing this can also lead to better decisions for selecting the make and model of battery being used, where options might matter. Safety – Like almost any other “system” in your warehouse, batteries also require a good balance between the need for productivity and safety. But also like most other systems, the two do not compete with each other, but rather reinforce the other. With Lead Acid batteries, the chief culprit in the hazard equation is sulfuric acid spills. Not only can these lead to damaging property but can be the cause of severe personal injuries and the associated costs to worker comp and morale. Chalky residues on the floor are just one indicator of a problem – something resulting from sulfuric acid spills from improper water replacement. Now for the easy part. Generally speaking, relative to Lead Acid batteries, your Lithium Ion batteries will not need almost any of the above maintenance. So yes, while they may represent a greater investment up front of up to 3 to 5 times the cost of a lead acid battery, it pays to look at how they perform for you over time. Creating a “Cost of Ownership” model for your business will tell you if Lithium is a better option for you. Given how prices continue to come down as production expands, it most likely will be a better cost option in the near future if it is not already. Charging – It’s important to monitor the charging of your batteries. Some Lithium chemistries can have up to 3,000 cycles before replacement, but it’s a good idea to monitor the charge time involved. If charging starts to take significantly longer than normal, the battery may need replacement. If the battery is idle and not in active use, make sure it is charged to about 50% every six months or so while in storage. Inspection – ensure there are no punctures, leaking fluids or other damage on the battery casing. In these cases, take it out of circulation immediately and consult with your manufacturer for guidance on return, replacement or disposal. Safety – there are relatively few safety concerns for your staff working with these batteries, but rather a few guidelines to keep them safe from harm instead. Store them between 41 and 68 degrees Fahrenheit (5-20 degrees Celsius) when possible. Never disassemble, crush or dispose of them in fire or water. And avoid excessive shaking or vibrations as well as shorting out the external contacts. The biggest hazard with some varieties of Lithium is the potential for fire if any damage like this occurs. Despite the different regimen’s required to effectively maintain your batteries in your facility, it is a good idea to come up with a regular, process-driven approach to the charging, storage, and maintenance of your batteries. Even if Lithium may not need the entire infrastructure of a “charging room” for maintenance, it still makes good sense to have a dedicated space where they can be returned to for charging – even if that is only for security. As they are expensive and are getting smaller every day, these assets are worth the effort to keep them organized and maintained as you would other capital assets, especially if you are paying for them as a capital cost and not as a consumable, the way many lead acid batteries would be treated. Finally, consider the reality that more and more things will be equipped with portable power, and that you may have a facility that needs to manage both types of battery chemistries in the future if you are not doing so already.